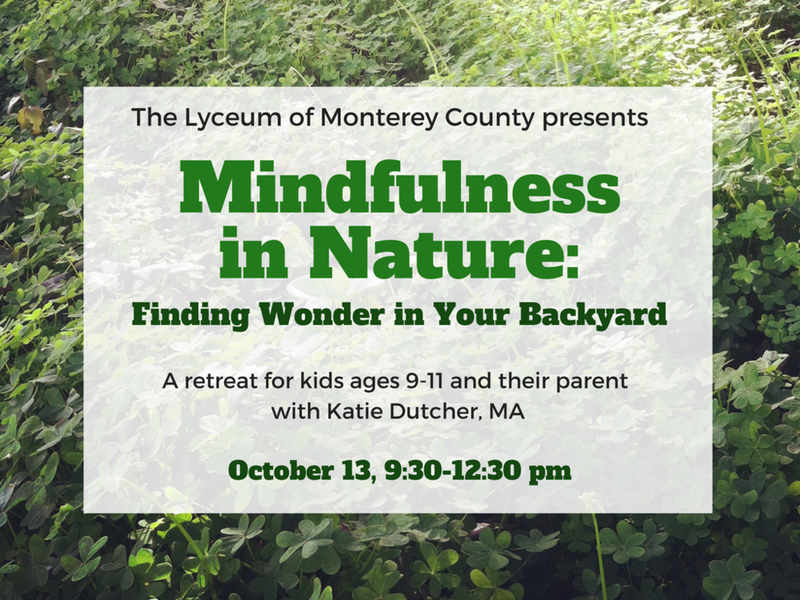 This retreat is for kids ages 9-11 and their parent— a collaboration between MBMS & The Lyceum of Monterey County. Taking a walk on the wild side, even when it's in the backyard, engages the senses, awakens curiosity, and catalyzes caring. It's free. It can happen anywhere. No batteries or charging are required. Anyone can do it. It, literally, brings a breath of fresh air into the day. Join us for a morning of timelessness— inviting play, creativity, story, and and wonder to discover what is living inside and all around us in the natural world. Katie Dutcher, MA, has been an educator since 2004 and has studied mindfulness since 2009. She is a Qualified Teacher of Mindfulness-Based Stress Reduction. She is a founding teacher at Monterey Bay Meditation Studio, a co-director of Mindful Education Project, and teaches mindfulness to children and adolescents in area schools.